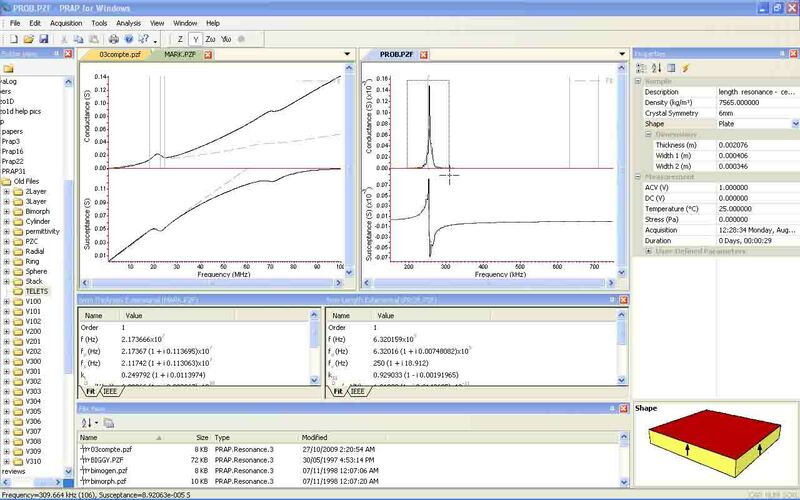 PRAP : Piezoelectric Resonance Analysis Program | TASI Technical Software Inc.
PRAP acquires impedance spectra and determines complex material properties through a variety of models. The software includes a variety of instrument drivers to directly acquire impedance spectra from instrumentation. Analyzing on higher order resonances allows the dispersion or frequency dependence of material properties to be explored while direct control of a temperature controller allows the temperature dependence of properties to be studied. The instrumentation interface of PRAP also allows DC bias to be varied to investigate electrostrictive behavior of a material along with time dependence to study ageing. By combining the analysis results for a variety of sample geometries, the complete piezoelectric matrix of a material can be constructed. PRAP runs under Windows XP and above including Windows 10. The user-friendly interface of PRAP ensures expert analysis is maintained in your laboratory regardless of personnel changes. The PRAP package accepts a variety of plug-in analysis and data acquisition modules. After the analysis of any resonance spectrum, PRAP uses determined material properties to generate a fit over the analyzed resonance spectrum. Conversely, any set of material properties can be used to generate a theoretical resonance spectrum. Aside from the visual confirmation of analysis provided by the fitted spectrum, a norm parameter is generated as an estimate of the 'goodness-of-fit'. See the 'Technical' section for the resonance modes supported by PRAP. 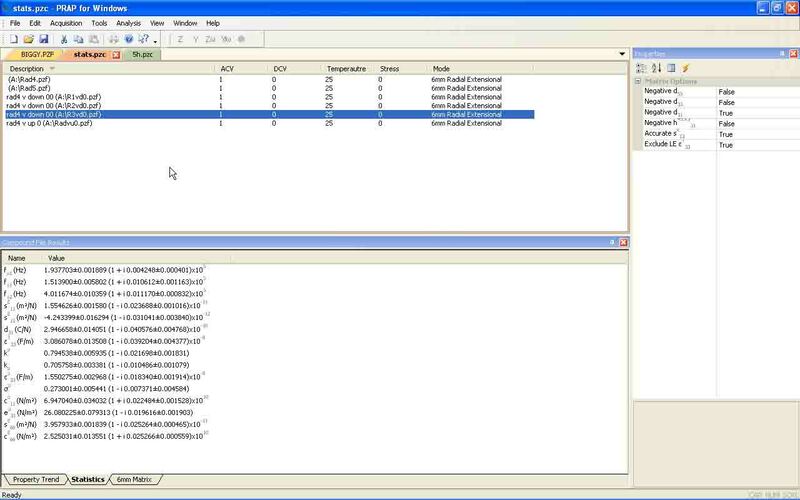 Analysis with PRAP is enhanced with the PRAP Compound file. The Compound file allows one or more related resonance spectra to be brought together in one document. This allows collective analysis of the spectra to be performed. Types of analysis include; determining the dependence of a material property on a measurement or process variable (such as d33 as a function of frequency or temperature), statistical studies on the results for a set of similar samples, or the computation of the complete piezoelectric matrix for a crystal symmetry supported by the existing PRAP installation. Determine the standard deviation in material properties for a set of similar specimens. Study the dependence of material properties on aspect ratio, geometry, density, etc. Study time dependencies through ageing or time response on DC bias field using the Time Data Acquisition Module. 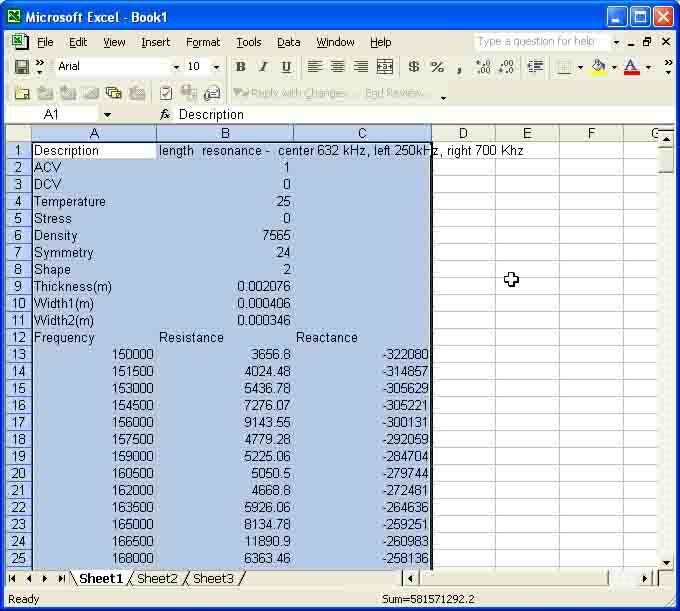 Study temperature dependence of material properties using the Temperature Data Acquisition Module. Study the DC bias field of electrostrictive or ferroelectric materials using the Bias Data Acquisition Module. The following modes are supported by PRAP, along with the material properties determined, and the required sample geometry. The arrow represents the sample poling direction. The limits in dimension should ensure that the resonance will be free of coupling with other resonance modes. kt, cD33, cE33,e33, h33, εS33. sE11, sE12, d13, εS33, kP, kp, εP33, σ, cP11, eP13, sE66. The arrow represents the sample poling direction. The limits in dimension should ensure that the resonance will be free of coupling with other resonance modes. In the rotated TE mode used by PRAP, the poling and specimen electrode surfaces are rotated some angle θ about the 'a' or 'b' axes of the crystal system. The TE mode rotated 45° about the 'a' or 'b' (X and Y) axes is of special use in constructing the complete 6mm piezoelectric matrix, as it eliminates the need for the 6mm LE mode which is generally difficult to measure accurately. The PRAP 6mm piezoelectric matrix tool recognises results for this mode when computing the complete 6mm matrix from the contents of a compound file. The arrow represents the sample poling direction. The limits in dimension should ensure that the resonance will be free of coupling with other resonance modes. In the rotated LTE mode used by PRAP, the poling and specimen electrode surfaces are rotated 45° about the 'c' axis of the crystal system. The LTE mode rotated 45° about the 'c' (Z) axis is required to construct the complete 4mm piezoelectric matrix. 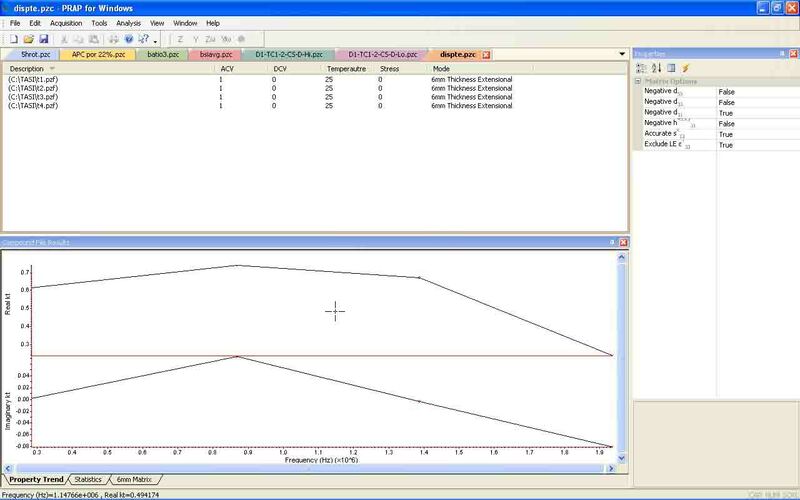 The PRAP 4mm piezoelectric matrix tool recognizes results for this mode when computing the complete 4mm matrix from the contents of a compound file. The 4mm breathing mode is the expansion mode in a square plate poled in the thickness direction. The breathing mode is of special use in constructing the complete 4mm piezoelectric matrix as given sE11, Ns provides sE12. The PRAP 4mm piezoelectric matrix tool recognizes results for this mode when computing the complete 4mm matrix from the contents of a compound file. The arrows represent the sample poling direction. The limits in dimension should ensure that the resonance will be free of coupling with other resonance modes. The arrows represent the sample poling directions. The backing is much thicker than the specimen. The limits in dimension should ensure that the resonance will be free of coupling with other resonance modes. The arrows represent the sample poling directions. The backing is usually much thicker than the specimen while the top layer, typically used to match the transducer to its projection medium, is thin compared to the piezoelectric. The limits in dimension should ensure that the resonance will be free of coupling with other resonance modes. Note that this can also be used to model the effect of thick electrodes on a thickness extensional resonator. The arrows represent the sample poling directions. The resonance is generated by applying a field opposite to the polling directions of the top and bottom halves. One half then contracts while the other extends which causes the bimorph to bend. The limits in dimension should ensure that the resonance will be free of coupling with other resonance modes. a is the flexural rigidity of the bimorph while EI is the product of the bulk Young's Modulus and the area moment of inertia. The arrow represents the sample poling direction. The limits in dimension should ensure that the resonance will be free of coupling with other resonance modes. This resonance is actually a shell breathing mode resonance. The arrow represents the sample poling direction. The limits in dimension should ensure that the resonance will be free of coupling with other resonance modes. This resonance is actually a ring or hoop breathing mode resonance. The arrows represent the sample poling directions. The resonance is generated by applying a field between the inner and outer radius of the specimen. This radial mode then couples with a length expansion mode to form the cylinder resonance. The limits in dimension should ensure that the resonance will be free of coupling with other resonance modes. The traditional circuit model used for a piezoelectric resonator is Van Dyke's circuit model. In this circuit diagram, the circuit components are traditional real capacitance's, resistance, and inductance. This model does not account for the impedance of the piezoelectric resonator away from the centre of the fundamental resonance peak, and does not work well for lossy resonators. This complex circuit model better accounts for the impedance of lossy resonators in the vicinity of the fundamental resonance peak frequency. As the radial resonance is defined using the fundamental and second order resonance peak, this model works over the frequency range of the first two resonance peaks. One or more PRAP analyzed resonance files can be added to a PRAP compound file (of extension '.PZC'). By including resonance spectra analyzed for samples of differing dimensions, density and other measurement conditions, the dependence of material properties on these parameters can be studied. The added resonance spectra should in general be acquired at the same DC bias voltage, temperature, etc. Open a new compound file with the 'New Compound File' command of the File menu. Using the File | Add Resonance File command or using the Edit | Paste command, add the spectra you wish to study. Ensure that each spectrum has been analyzed. You can do this by displaying each included resonance scan with the View | View Resonance Spectrum command. Selected the Analysis | Analysis Settings command. For the x-axis, select the sample or measurement property you are interested in.One or more user-defined parameters can also be specified for each spectrum. For the y-axis, select the material property to be studied. The list of available properties is limited to those available from the analyzed resonance spectra included in the compound file. Select 'OK'. The real and imaginary parts of the selected property will be plotted as a function of frequency. The results can be copied to the clipboard or printed on the PRAP printer..
One or more PRAP analyzed resonance files can be added to a PRAP compound file (of extension '.PZC'). By including resonance spectra analyzed at different temperature, the temperature dependence of material properties can be studied. The added resonance spectra should in general be acquired at the same DC bias voltage, temperature, etc. For the x-axis, select Temperature. Select 'OK'. The real and imaginary parts of the selected property will be plotted as a function of temperature. 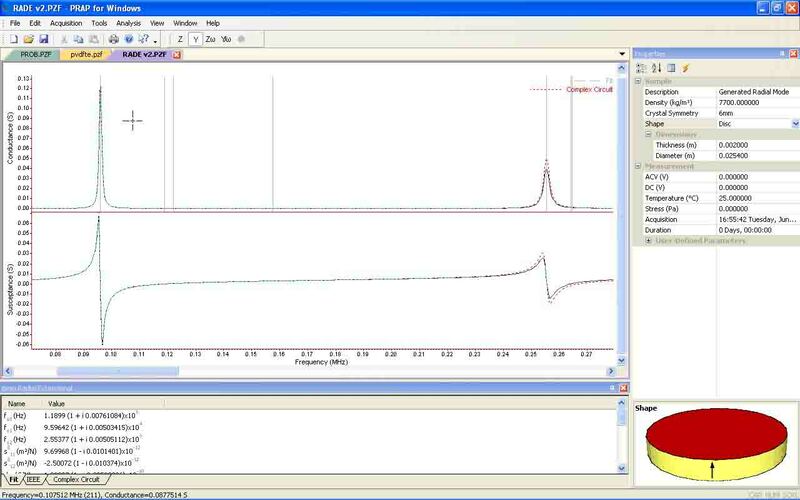 One or more PRAP analyzed resonance files can be added to a PRAP compound file (of extension '.PZC'). If each of these resonance files was acquired from samples with different applied DC bias voltages, or if each sample had a different thickness, each parameter can be plotted as a function of DC bias field. Once a material property is plotted as a function of DC bias field, voltage, etc., a general, even, or odd polynomial can be fitted to the property using the 'Non-linear Regression' command of the Tools menu. The coefficients of the fitted polynomial can then be used in additional studies of your materials. For the x-axis, select DC Bias. Select 'OK'. The real and imaginary parts of the selected property will be plotted as a function of dc bias. One or more PRAP analyzed resonance files can be added to a PRAP compound file (of extension '.PZC'). By including resonance spectra analyzed at different times, the time dependence of material properties can be studied. The time since poling or since the application of a DC bias voltage could be studied. The added resonance spectra should in general be acquired at the same DC bias voltage and temperature. For the x-axis, select Time. Select 'OK'. The real and imaginary parts of the selected property will be plotted as a function of time. One or more PRAP analyzed resonance files can be added to a PRAP compound file (of extension '.PZC'). By including resonance spectra analyzed using different order resonance peaks, or by including the resonance spectra for samples having the same dimension aspect ratio and different resonance lengths, the frequency dependence of material properties can be studied. The added resonance spectra should in general be acquired at the same DC bias voltage, temperature, etc. For the x-axis, select Frequency. One or more PRAP analyzed resonance files can be added to a PRAP compound file (of extension '.PZC'). If each of these resonance files is of different samples of the same material, the compound file will provide the average of the determined material properties along with the standard deviation of these properties given as the uncertainty in each property. where N is the number of available results for each property. Note that each included analyzed resonance spectrum should generally be of the same resonance mode using the same order resonance peak. Other resonance modes and peaks can be used if frequency dispersion is to be ignored. Statistical results can be copied to the clipboard or printed on the PRAP printer. Due to over-parameterization, frequency dispersion in material properties, and experimental errors, the analysis results from the thickness mode will not be identical to the [sE, d, εT] matrix transformed to the [cE, e, εS] matrix. The value for sE13 can be improved by transforming the completed matrix to the [cE, e, εS] matrix representation, comparing the corresponding cE33 to the value of cE33 determined directly from the resonance modes included in the compound file, and adjusting sE13 by the discrepancy. This procedure can then be repeated until results converge. Using the File | Add Resonance File command or by pasting from the clipboard, add the spectra you wish to study. Ensure that each spectrum has been analyzed, and that samples from the 4 above-mentioned modes are included. You can ensure the spectra are analyzed by displaying each included resonance scan with the View | View Resonance Spectrum command. The signs of piezoelectric constants cannot be determined by resonance analysis. Assign the signs manually in the Properties view. In the same view the refinement options discussed above can be assigned. The matrix representation displayed can be selected from the View menu. The determined matrix properties are displayed in the Compound File Results view by selecting the Matrix tab. Matrix results can be copied to the clipboard or printed on the PRAP printer. Use of the LE mode is the usual way of computing the complete piezoelectric matrix. Because of the length of samples needed to induce the LE mode, they are difficult to pole and difficult to measure. In addition, properties determined from the LE mode are generally of a significantly lower frequency then the properties determined by the other three modes. PRAP includes an additional TE mode where the direction of poling has been rotated 45° about the x or y axis. Use of this mode in the PRAP compound document permits the computation of the complete 6mm piezoelectric matrix of a material without use of the LE mode. Select the mode and frequency of the spectrum to be generated. If a resonance spectrum is open in PRAP, the 'Assign Spectrum Settings' button will populate Sample and Measurement properties of the generated spectrum with those from the open existing spectrum. If a resonance spectrum is open in PRAP and the spectrum is analyzed with the same mode selected to be generated, the 'Set Mode Properties' will populated the material properties with those determined for the analyzed existing spectrum. if 'Generate into Current Window' is selected, the generated spectrum will be placed into the open spectrum as a fit. Otherwise the new spectrum will be generated into a new resonance spectrum file. Click on the Sample and Measurement tabs to assign the desired parameters for the generated spectrum. The radial mode is unusual in that it cannot be analyzed by non-linear regression, and analysis with the mouse requires use of the fundamental and 2nd order resonance peaks. Choose which analysis results are to be generated. Also select 'determine results for minimum norm' to choose whether the software will determine the best set of side-band frequencies, or whether it will have the user explicitly indicate these frequencies with the mouse. The Automatic fields determine the range of frequencies searched for a maximum upon selecting the Auto Analyze command. Press OK.
Holding down the control key, click on the fundamental resonance peak. If the spectrum is not displayed in the Zω representation, the software will prompt you to make the transformation. If 'Locate nearest peak on click' was selected in the Analysis Settings dialog, the software will locate the maximum in the real part nearest the clicked point. If 'determine results for minimum norm' was selected in the Analysis Settings dialog the software will complete analysis of the radial mode. Otherwise holding down the control key you should select a point below the resonance peak with the left mouse button, clear of any 'bounce' in the spectrum and near the maximum in the G/ω representation. Holding down the control key, select a point above the resonance peak with the left mouse button. This should be near the minimum in the Xω curve of the spectrum at the fundamental resonance. Holding down the control key, select the 2nd order resonance peal. with the left mouse button. If 'Locate nearest peak on click' was selected in the Analysis Settings dialog, the software will locate the maximum in the real part nearest the clicked point. Holding down the control key you should select a point below the 2nd order resonance peak with the left mouse button, clear of any 'bounce' in the spectrum and near the maximum in the 2nd order peak G/ω representation. Holding down the control key, select a point above the 2nd order resonance peak with the left mouse button. This should be near the minimum in the Xω curve of the spectrum at the 2nd order resonance peak. Holding down the control key, click on the point used to evaluate permittivity with the left mouse button. This should in general be located between the fundamental and second order peak, or below the fundamental peak. The options selected in the Analysis Settings dialog will dictate the results generated. Plotted results will have a legend on the right side of the graph. The analysis of most resonance spectra are similar to the analysis of the TE mode. Depending on the mode, the Zω and G/ω representations may be reversed. There are two fundamental ways of analyzing most resonance spectra. One is by non-linear regression, the other is with the mouse that utilizes a modified form of Smitt's method. The advantage of non-linear regression is that it provides an estimate of the uncertainty in the fitted properties. The disadvantage is that it is fitted over a range of frequency which becomes problematic when there is dispersion, and the method in general can suffer from degeneracies that can prevent convergence on a solution. 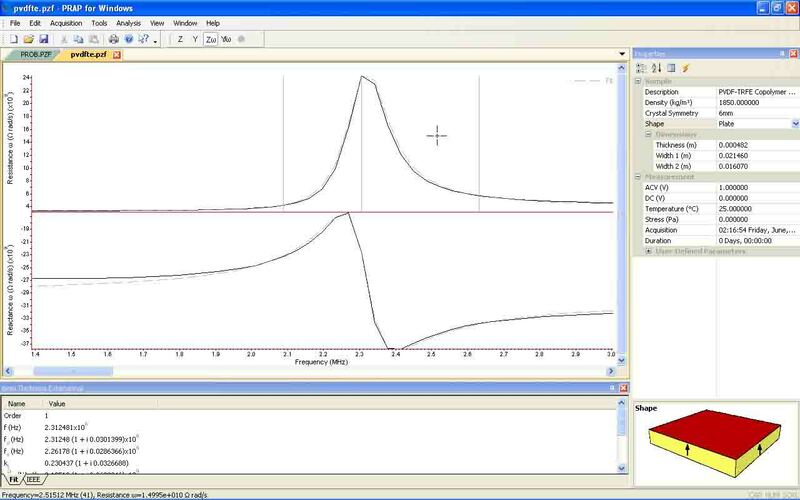 The advantage of analysis with the mouse is that analysis can be isolated to the frequency region of the resonance peak, and it is possible to explicitly select which data points are used. 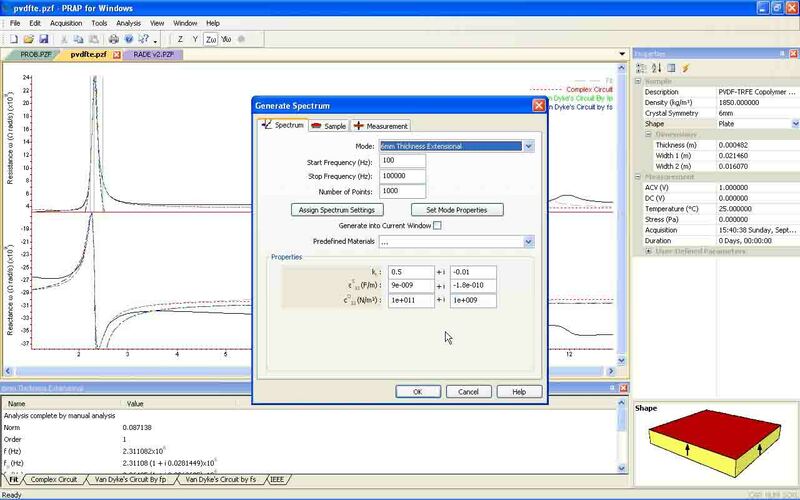 Analysis with the mouse is the preferred form of analysis with PRAP (if it is available for the chosen resonance mode). Ensure chi-squared and the minimal fractional change in chi squared are sufficiently small to ensure convergence. You may want to experiment with this for your spectra. You can also put restraints on the fitted material properties. Select Analysis | Fit Parameters. Specify the range of frequency to be fitted and the initial material property values. If analysis of the spectrum has already been done, the 'Use parameters of last fit will populate the properties with the previously determined properties of the mode. Select Fit. The fitted impedance curve should plotted as the parameters are updated. Choose which analysis results are to be generated. Also select 'determine results for minimum norm' to choose whether the software will determine the best pair of side-band frequencies, or whether it will have the user explicitly indicate these frequencies with the mouse. The Automatic fields determine the range of frequencies searched for a maximum upon selecting the Auto Analyze command. Press OK.
Holding down the control key, click on the resonance peak. If the spectrum is not displayed in the Zω representation, the software will prompt you to make the transformation. You should then enter the order of the selected resonance peak. The fundamental is order 1, etc. If 'Locate nearest peak on click' was selected in the Analysis Settings dialog, the software will locate the maximum in the real part nearest the clicked point. If 'determine results for minimum norm' was selected in the Analysis Settings dialog the software will complete analysis of the mode. Otherwise holding down the control key you should select a point below the resonance peak with the left mouse button, clear of any 'bounce' in the spectrum and near the maximum in the G/ω representation. Holding down the control key, select a point above the resonance peak with the left mouse button. This should be near the minimum in the Xω curve of the spectrum. The best way to obtain resonance spectra is by directly acquiring them from an impedance analyzer using the PRAP Data Acquisition interface. However it is also possible to import resonance spectra into PRAP by pasting from the clipboard or loading as a text file. To proceed use the File | Save As command with an existing PZF file and select the PRAP Export Resonance File as the file type, or use the PRAP Edit | Copy command to copy an existing spectrum to the clipboard, then pasting it into a spreadsheet. This will ensure the correct fields are included. The fields should then be repopulated with details of the spectrum to be imported, and the resulting new file opened with the PRAP File | Open command (selecting the PRAP Export Resonance File as the file type) or pasting into PRAP with the Edit | Paste command. Fields in the import file should be tab-delimited. 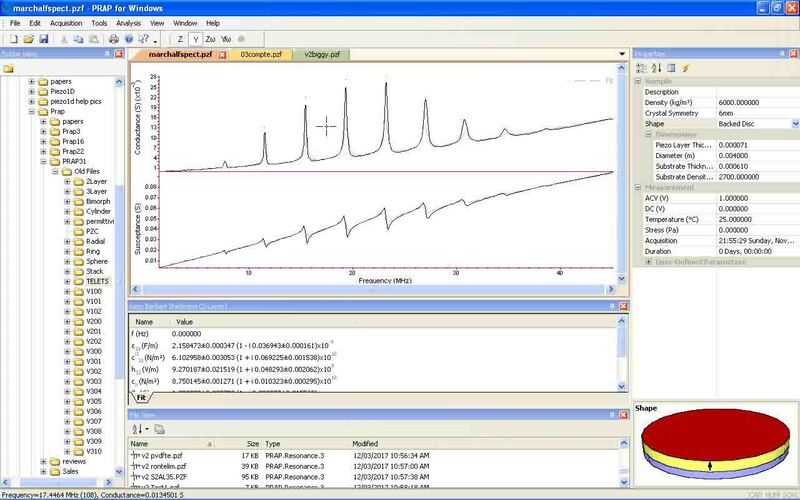 PRAP provides a graphical interface for loading, acquiring and analyzing resonance spectra. Each region of the interface is fully dockable meaning they can be re-arranged, opened or closed. The Folder View shows the folders of the file system while the File View shows the PRAP resonance and compound files of the file system. Resonance spectra and compound files are tabbed, and two files can be displayed side-by-side by dragging a tab off the tab frame. Analysis results are shown below the spectrum or compound file display in tabbed windows. The file properties are shown in the Properties View for the selected PRAP file. The representation of a resonance spectrum can be controlled from the View menu where it can be displayed as a frequency spectrum or a locus plot. The representation can be selected between various types of impedance and admittance plots. The View menu also allows control of the plotting of lines and data points, and whether the y-axis is plotted in a linear or logarithmic scale. The range of spectrum display can be controlled with the house. Clicking with the left mouse and dragging over the spectrum graph will allow a sub-range of the spectrum to be plotted. Clicking with the right mouse button steps out one 'zoom' level. Released in 2017, Version 3.1 of PRAP is a completely re-designed application that continues to support the analytical capability of version 2.2. It is a 32bit Windows application that runs under Windows 7, 8.1 and 10. It will also continue to run on Windows XP systems. Most notable is that all acquisition and analysis modules of PRAP 2.2 are now included in the standard software license. All releases of PRAP are available for download. Any of these revisions can be activated in Basic Mode. Basic Mode enables only the TE Resonance mode for analysis. With a Customer Number valid for the release date of each revision, the software can be fully enabled. Added customer number to email Activation email. Added 'Add Resonance Spectrum' to PRAP Compound Document.